BEEN TO THAT CHAMBER EVENT? The first time out is rough. For so many trainers completely comfortable in the gym in sweats, tights, and in front of mirrors (where other people would be freaking out! ), in a dress and heels or a suit they are a mess. They don’t know what to do with their hands, how to conduct themselves, or what to say. Perfectly natural. After all, how comfortable were you first time at a junior high dance? Or at the prom dressed in a tux or glam dress for the first time when you had to pick up the date and do photos and all that? So first time is first time. What I want to save you from is doing what too many people do. In other words, don’t follow. If you were told you need to stuff your shirt full of business cards and make it your business to be empty by the end of the event, think again. Your card is going in the garbage or a desk drawer where months from now it will go in the garbage. You don’t win by seeing how fast you can hand out that box of 500 business cards. 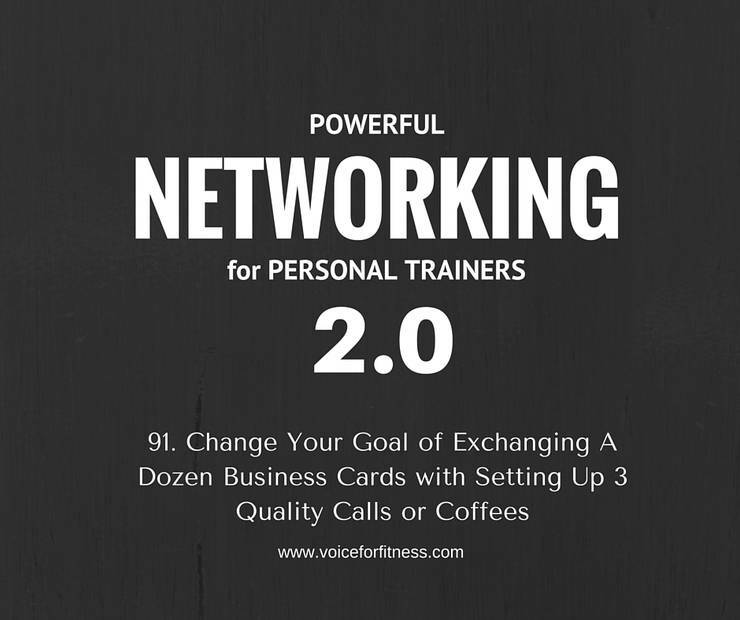 You win by making 2 or maybe three quality contacts during an event. If you’re smart and observant and you connect with the right three people it will make all the difference. Be interested. Not interesting. Sure, tell a good story, but more important than that, ask for a good story. Let whoever you’re talking to be the star of the show. Be genuinely interested. Comments like, “cool” or “that’s awesome” though, won’t do. They are overused, surfer dude lingo and make you seem like a young groupie. Ask a specific question. If you’re really listening and not worried about yourself this is easy. Someone is talking about skiing, or hunting, or something they think is hilarious that their kids did. Ask a relevant question… how long have you been ________? how did you get started? How old are your kids? How many? What size family did you come from? Most people love to talk about themselves. By reciprocity most will then turn the tables and ask about you. That’s your chance to share what you do..and why you do it. Then it’s also a chance to ask them what they do for themselves. Inevitably it will spill out what level of interest they have in what you do. That’s your chance to invite them to lunch or coffee in the next week. Ask if you can call and share a few ideas for them about how to get what they want. You both have to eat, that way it’s neutral territory and not a setting either of you feels intimidated in. That kind of follow up is the kind that will get you further than business cards randomly passed out. Give that person one, collect theirs and read it – make sure that that is the best number to reach them directly.